What is Eyebag & Eyelid Surgery (Blepharoplasty) ? There are many signs of ageing for men and one of the area many males are concerned with is the areas around the eyes. Excess skin around the upper eyelid can create folds and wrinkles, while excess skin around the lower eyelid can create the appearance of bags under the eyes and look of permanent tiredness, while also adding years to the whole face. There are many creams and lotions available in the market which claim to temporarily relieve these symptoms, to restore youthfulness however a more permanent option is to consider a surgical correction procedure. Upper eyelid surgery and lower eyelid surgery are known as blepharoplasty and involve the removal of excess skin and fat pouches from the eyelid area or eyebag area respectively. However, Blepharoplasty procedure will not remove dark circles under the eyes, lift sagging eyebrows (a Browlift surgery is required), or smooth fine wrinkles or crow’s feet. Blepharoplasty can be performed on the upper or lower eyelids, or both if necessary. Your eyesight will be assessed before surgery along with your ability to produce tears. During blepharoplasty surgery a local anaesthetic is usually used along with a sedative. During surgery, incisions are made around the skin of the eyelid which loosens the skin and muscle. This is then removed with further cutting. Fine sutures are used to close the incisions leaving fine lines across the eyelid. These normally heal and fade to very fine, almost indistinguishable marks within three months. The surgery usually lasts between one to two hours. In order to reduce inflammation and discomfort an ophthalmic cream is applied to the eyelid area underneath dressings which are soaked in a cold saline solution. The area around your eye will be swollen for around a week and you may find your eyes are sensitive to light for a few weeks. Other side effects include watering eyes and visual fluctuations which should pass within a few weeks. After this time you should be able to see the results of your surgery, with your younger fresher appearance. You will usually be able to return to your day to day life within eight to ten days. After your blepharoplasty surgery it is vital that you follow the aftercare instructions given to you by the clinic and make sure that you attend all follow up appointments. 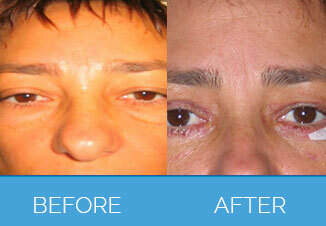 As with any surgery, there is the small risk of complications with blepharoplasty surgery. At the time of your consultation, the expert we refer you to will take you through the risks in detail so that you can take an informed decision. They will not push you for surgery. They will give you all the time and guidance you need to take a decision. They will give you a comprehensive Blepharoplasty Patient Guide to take home with you. This will answer most of your queries and concerns. If you have any further questions, you can give them a call and they will provide their expert advice. You will love them for their honesty, integrity and professionalism. Our Cosmetic Surgeons are leaders in the field of cosmetic Surgery. Your Consultation is Completely Free. Depending on the complexity of the procedure, the surgery normally takes about 90 minutes, not including time in recovery. Are the results permanent ? 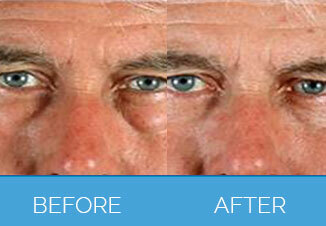 The results of eye bag correction normally last for about five years. After this, the skin will begin to sag again, however, they will always have a better appearance than if you had never had the surgery. When can I go back to normal day-to-day activities ? We recommend that people take a week off work following the procedure (more if your job is particularly physical). Strenuous activities, heavy lifting and intense exercise should be avoided for about 6 weeks after your surgery. Bruising may remain for a few weeks after surgery, so you may wish to consider this when booking time off work. Are there any alternatives to this surgery ? The only way to fully remove upper or lower eye bags is by surgery. Some forms of non surgical procedures may help to lift the eye area (for example wrinkle smoothing around the eyes) however the effect will not be substantial enough to remove eye bags. Can I combine this procedure with other surgery ? Yes, you can combine this procedure with other facial procedures. You can discuss this in full at your free consultation. Will I have altered sensation in the area ? Will my eyesight be affected ? No, your eyesight will not be affected by eye bag reduction surgery. What weight should I be for surgery ? For the best aesthetic results, we recommend that you are at your ideal weight at the time of surgery as further weight loss or gain can change the results of your surgery. Am I too young/ too old for this procedure ? Can I get a second opinion ? Are your surgeons suitably qualified and registered ? Where are your clinics ? There are no patient stories for Male Eyebag Removal. Any form of cosmetic enhancement is very personal, so prices are bespoke dependent on your individual needs. As a rough guide, you can expect to pay £2990 -£3990 for upper and lower eye bags.